The phrase Φύσις κρύπτεσθαι φιλεῖ – attributed to Heraclitus [See Note 1] – is often translated along the following lines: Nature loves to conceal Herself (or, Nature loves to hide). Such a translation is somewhat inaccurate, for several reasons. First, as used here, by Heraclitus, the meaning of Φύσις is rather different from his other usage of the term, as such usage is known to us in other fragments of his writings. For the sense here is of Φύσις rather than φύσις – a subtle distinction that is often overlooked; that is, what is implied is that which is the origin behind the other senses, or usages, of the term φύσις. Thus, Φύσις (Physis) is not simply what we understand as Nature; rather, Nature is one way in which Φύσις is manifest, presenced, to us: to we human beings who possess the faculty of consciousness and of reflexion (Thought). That is, what we term Nature [See Note 2] has the being, the attribute, of Physis. As generally used – for example, by Homer – φύσις suggests the character, or nature, of a thing, especially a human being; a sense well-kept in English, where Nature and nature can mean two different things (hence one reason to capitalize Nature). Thus, we might write that Nature has the nature of Physis. Second, κρύπτεσθαι does not suggest a simple concealment, some intent to conceal – as if Nature was some conscious (or anthropomorphic) thing with the ability to conceal Herself. Instead, κρύπτεσθαι implies a natural tendency to, the innate quality of, being – and of becoming – concealed or un-revealed. Thus – and in reference to fragments 1 and 112 – we can understand that κρύπτεσθαι suggests that φύσις has a natural tendency (the nature, the character) of being and of becoming un-revealed to us, even when it has already been revealed, or dis-covered. How is or can Φύσις (Physis) be uncovered? Through λόγος (cf. fragments 1, and 112). Here, however, logos is more than some idealized (or moralistic) truth [ ἀληθέα ] and more than is implied by our term word. Rather, logos is the activity, the seeking, of the essence – the nature, the character – of things [ ἀληθέα akin to Heidegger’s revealing] which essence also has a tendency to become covered by words, and an abstract (false) truth [ an abstraction; εἶδος and ἰδέα ] which is projected by us onto things, onto beings and Being. Thus, and importantly, λόγος – understood and applied correctly – can uncover (reveal) Φύσις and yet also – misunderstood and used incorrectly – serve to, or be the genesis of the, concealment of Φύσις. The correct logos – or a correct logos – is the ontology of Being, and the λόγος that is logical reasoning is an essential part of, a necessary foundation of, this ontology of Being, this seeking by φίλος, a friend, of σοφόν. 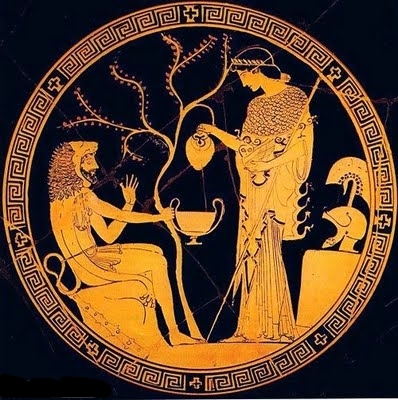 Hence, and correctly, a philosopher is a friend of σοφόν who seeks, through λόγος, to uncover – to understand – Being and beings, and who thus suggests or proposes an ontology of Being. Essentially, the nature of Physis is to be concealed, or hidden (something of a mystery) even though Physis becomes revealed, or can become revealed, by means such as λόγος. There is, thus, a natural change, a natural unfolding – of which Nature is one manifestation – so that one might suggest that Physis itself is this process [ the type of being] of a natural unfolding which can be revealed and which can also be, or sometimes remain, concealed. Third, φιλεῖ [ φίλος ] here does not suggest “loves” – nor even a desire to – but rather suggests friend, companion, as in Homeric usage. In conclusion, therefore, it is possible to suggest more accurate translations of the phrase Φύσις κρύπτεσθαι φιλεῖ. All of which correctly leave Φύσις untranslated (as Physis with a capital P), since Φύσις is the source of certain beings [or, to be precise, Physis is the source of, the being behind, our apprehension of certain beings] of which being Nature is one, and of which our own, individual, character, as a particular human being, is another. One translation is: Concealment accompanies Physis. Or: Concealment remains with Physis, like a friend. Another is: The natural companion of Physis is concealment. Or, more poetically perhaps, but much less literally, one might suggest: Physis naturally seeks to remain something of a mystery. Heraclitus flourished c. 545 – 475 BCE. Nature can be said to be both a type of being, and that innate, creative, force (that is, ψυχή) which animates physical matter and makes it living.